Senior officials from multiple provinces are predicting a tense and difficult first ministers meeting when premiers gather to discuss the economy and trade with Prime Minister Justin Trudeau in Montreal on Friday. "You can expect a little dustup. There's no doubt about that," said one provincial source who spoke to CBC News on condition they not be named. The tensions became obvious during a conference call between the premiers on Tuesday afternoon. According to sources with knowledge of the call, several premiers voiced frustration with the draft federal agenda, which sets aside a significant amount of time to talk about issues important to the federal government and leaves only an hour for the provinces to raise their own priority issues. "The agenda as presented had the prime minister fitting in a train of his cabinet ministers to lecture the premiers on the topics of his choosing," said a second source from another provincial government, who also spoke on the condition of anonymity. The main point of contention in the first ministers' agenda is the plan to give three federal cabinet ministers — Finance Minister Bill Morneau, Environment Minister Catherine McKenna and Intergovernmental Affairs Minister Dominic LeBlanc — two hours and 45 minutes in the middle of the day to lead discussions on trade and competitiveness, climate change and interprovincial trade barriers. The premiers' roundtable which follows is set to run only 60 minutes. The PMO late Wednesday reached out to CBC News to say that the ministers will only be speaking for a few minutes at the beginning of their part of the meeting before premiers are invited to voice their concerns. The provinces have been agitating to set aside time at the meeting to talk about the downturn in the oil sector and Bill C-69, which overhauls the process for major project approval in Canada. Critics say C-69 will make it harder to advance large scale energy projects for development. "Well, I can guarantee you one thing. If the agenda doesn't change, the premiers will change the agenda during the meeting itself," Manitoba Premier Brian Pallister told CBC's Power & Politics today. "Because there are concerns obviously evident in our oil-producing regions in the country that impact on every other province and that impact on our GDP ... on our ability as Canadians to support each other and our Canadian family. So we need to have those discussions, we need to have them now. And those discussions shouldn't wait." Alberta Premier Rachel Notley and Saskatchewan Premier Scott Moe sent a letter to Trudeau this week demanding that the "crisis facing the energy industry" be added to the agenda. Other premiers argue it's impossible to have a first ministers meeting about the economy without carving out time to discuss the impact of C-69​. "There's a fundamental difference between premiers talking to the prime minister about C-69 and having the federal minister stand in front of the premiers and lecture them on C-69," said the second provincial source. "We want to actually have a conversation with the prime minister." Trudeau told journalists today that he and his ministers will come to the meeting willing to discuss "anything the premiers want to talk about," including "oil, of course." "Natural resources are an essential part of our economy. We're going to be talking about that as well." The PMO also told CBC late Wednesday that the challenges facing the oil and gas sector will be discussed as part of Morneau's section of the meeting which is on trade, economic competitiveness and jobs. There's no indication that the formal agenda itself has changed, however. Federal officials insist those core provincial issues can be addressed in the larger conversations. But the premiers want them listed as formal agenda items so they don't end up treated as afterthoughts at the end of the day's discussions. Provincial sources say they're not very optimistic about the chances of a consensus emerging when the meeting wraps up on Friday. The first provincial source predicted there would be "head-shaking more than handshaking" by the time the leaders leave Montreal. A draft communique has been circulating between the provincial and federal representatives. Right now, a significant number of premiers are unhappy with it — and the first provincial source suggested that a joint communique at the end of the meeting might not be possible. The tension in the run-up to the meeting underscores just how much the provincial landscape has changed since Trudeau became prime minister. Since he brought back the practice of regular federal-provincial meetings (his predecessor, Stephen Harper, tended to skip them), Trudeau has seen a string of allies go down to defeat in provincial elections — most notably in Ontario, where Kathleen Wynne has been replaced by Trudeau critic Doug Ford. Now a clear alliance is developing between a powerful bloc of conservative premiers — Ford in Ontario, Pallister in Manitoba and Scott Moe in Saskatchewan — against Trudeau's carbon-pricing climate plan, which imposes a carbon tax on all three provinces and on New Brunswick. Blaine Higgs, New Brunswick's new premier, also has vowed to fight the carbon pricing plan. Friday's first minister meeting will be the first attended by Higgs and Quebec Premier ​François ​Legault. Higgs told CBC today that he's confident the premiers will have "a very open discussion" that will dive into the crisis in Canada's energy sector and the shortcomings of C-69. 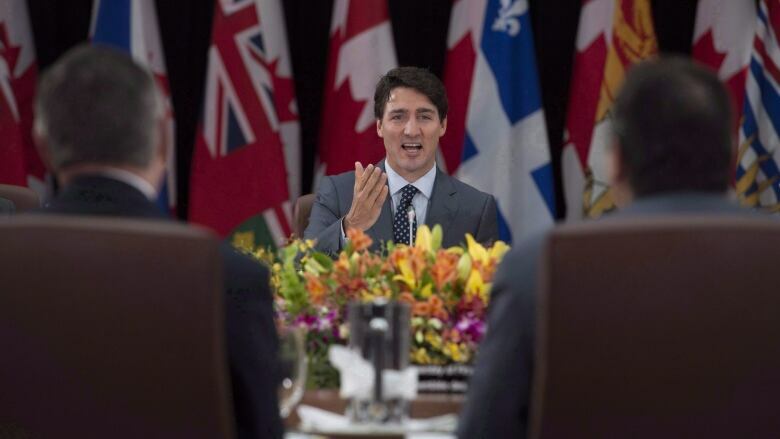 While the formal agenda is set for Friday, the premiers and the prime minister will gather on Thursday night for a private working dinner at a Greek restaurant in Trudeau's riding of Papineau. Instead of the leaders dining privately, each will be allowed to bring a "plus one" in the form of a senior political staffer.